Building a vehicle security system has been in mind for a while, however, a recent surge in motorcycle thefts from my university has forced me to pick up the pace with development. 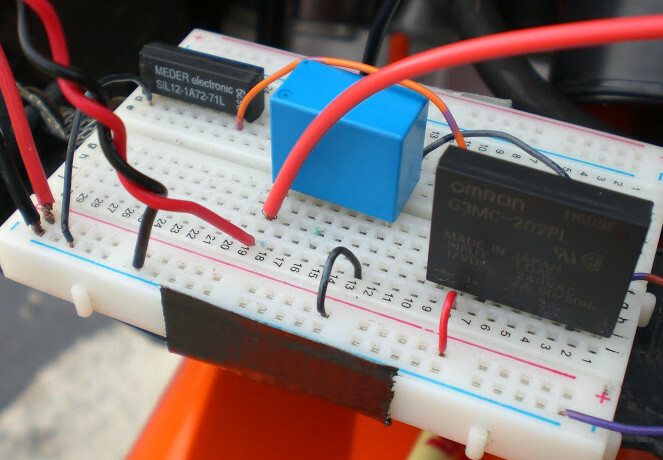 What this circuit does is diable the fuel pump, once the bike’s power is turned on from the ignition, until a magnet must be passed over a hidden reed switch to activate a latching relay. 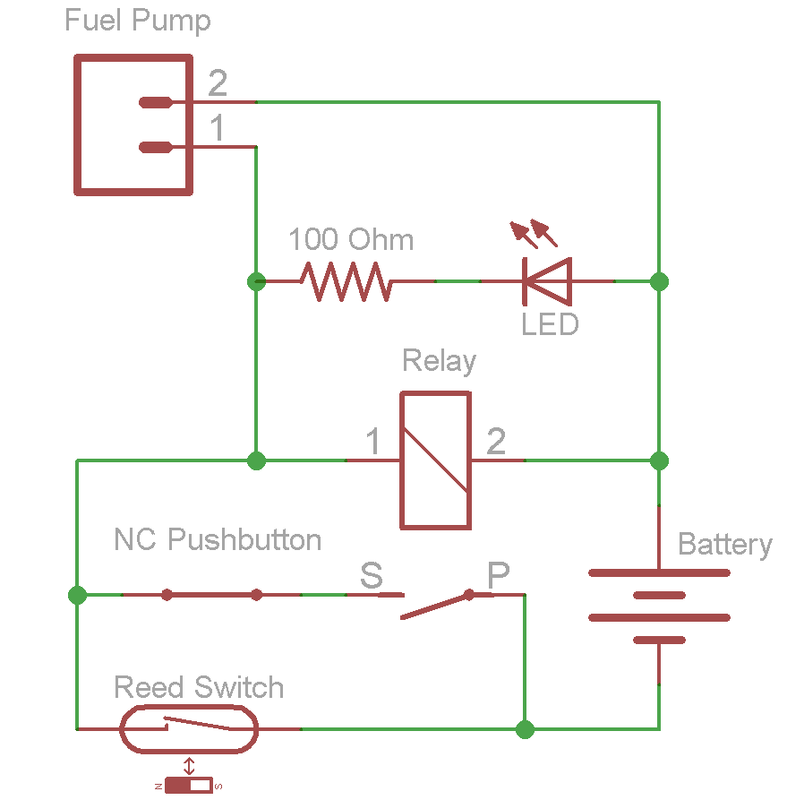 This latched relay will continuously power the fuel pump until a) the ignition is turned off, b) the engine kill-switch is used, or c) a button on the handlebar is pressed that silently resets the circuit (without killing the engine). 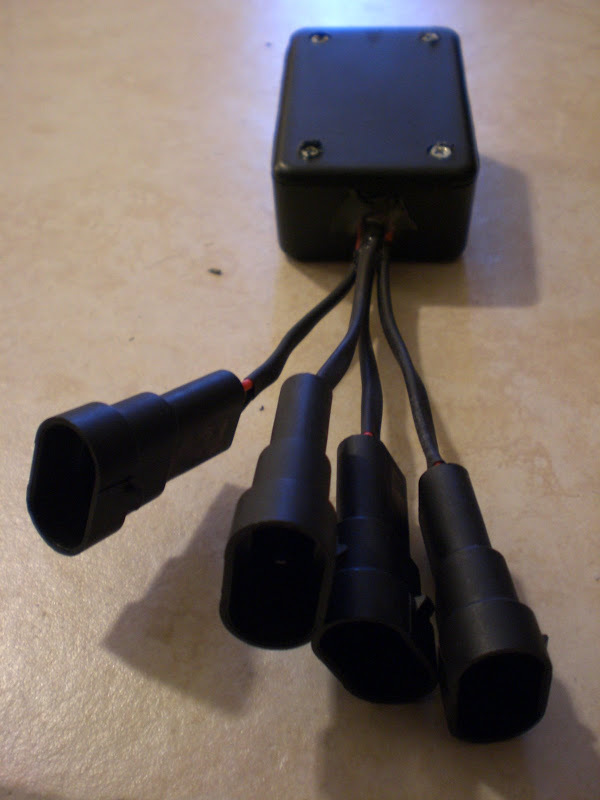 An LED is used to quickly identify whether power is going to the fuel pump. A normally-closed (press to open) pushbutton will release the relay, and is mounted on the handlebar for emergency use. This would be used in a motorcycle-jacking situation. Instead of disabling the bike immediately, which could produce a tense situation if a weapon is involved, the system silently turns the fuel pump off, leaving enough fuel in the carburetor bowls to drive ~1/8 mile. 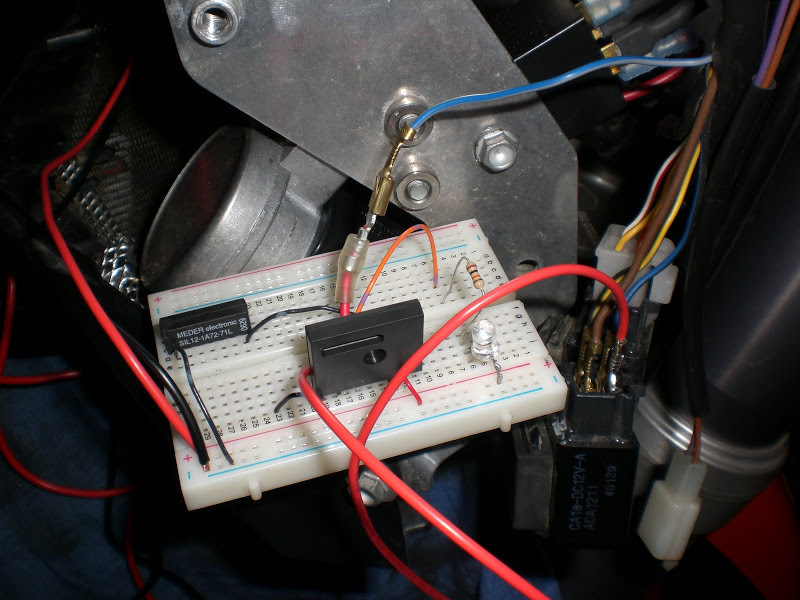 After using the fuel in the carburetor bowls, the bike will stall and won’t start until the fuel pump is activated, by waving the magnet over the reed switch again. Even if the location of circuit is known, the placement of the reed switch would not be apparent until body panels are taken off. The magnet can even be sewn into the sleeve of a jacket, so the hand placement over the reed switch or timing of its activation doesn’t necessarily give away the position of the switch. The switch can also be reactivated after the bike drives off, since the fuel in the carburetor bowls will still allow the bike to run a short distance. This can be crucial if you can predict a motorcycle-jacking, even if by a few seconds. If the reset button is pressed only to find it was unneeded, just a wave of the sleeve is needed to restore power to the fuel pump. 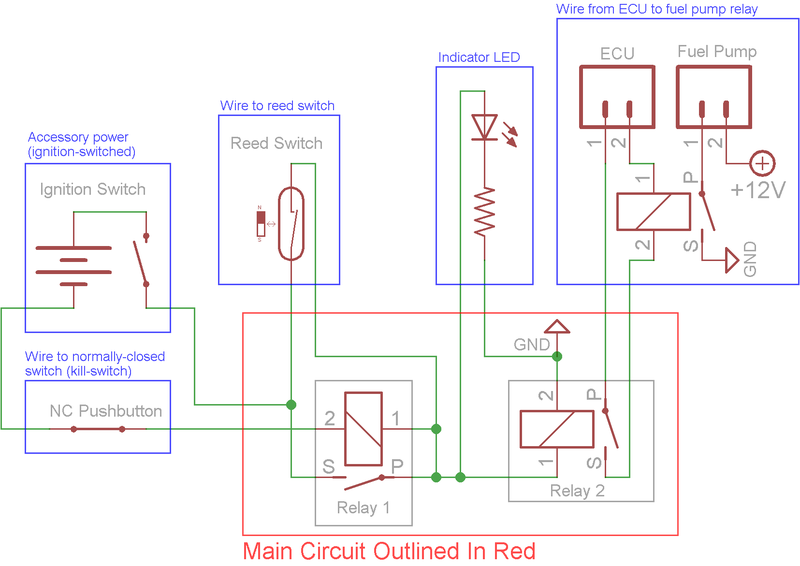 This circuit should also work with fuel injection, but would have to be activated before starting the bike. It must be mentioned that many fuel pumps allow fuel to flow when no power to the pump is supplied. This allows fuel to continually flow to a carburetor until the fuel in the tank drops below the level of the bowl. In the case of carbureted bikes with high-mounted tanks, fuel pumps are unnecessary. For instance, the stock fuel pump of the motorcycle I’m designing this for, the KTM 950 Adventure, does not inhibit fuel flow when the pump is not energized. To make this circuit work with this bike, the stock fuel pump must be replaced by a an aftermarket pump, such as the Facet 40171 solid state airplane pump that I previously installed. The design of this pump prevents fuel flow when power is not present. On the subject of local bike thefts, the perpetrators at my university are breaking the ignition by force and driving off. A friend of mine had his ignition broken recently, but his alarm system deterred the thief. Also, a few months ago, he was followed while he was driving home from campus. I personally use the steering lock, a disk lock, and occasionally a bike cover. I built this with the added benefit of preventing a jacking while driving or about to drive. It would also be convenient if I were to want to get off my bike briefly but don’t want to put my disk lock on. The circuit itself would be easy to bypass if the side panels came off, which takes just a minute or so. This isn’t something a thief is likely to do unless there was knowledge of the device. Even in that case, knowing the right wires to cross after that would also require intimate knowledge of the design. There are pretty good odds that if the bike stalls and won’t start, the thief wouldn’t bother to start removing panels to diagnose the electrical problem. 1: The ECU turns the fuel pump on and off. 2: The ECU controls the fuel pump through a relay. Page 266 of the repair manual shows the wiring for this. [Referencing the manual] I chose to have the relay switch the blue-grey wire between (1) on the ECU to (2) of the fuel pump relay. I used ACC2 (power switched with ignition) with the reed switch to trigger the relay. 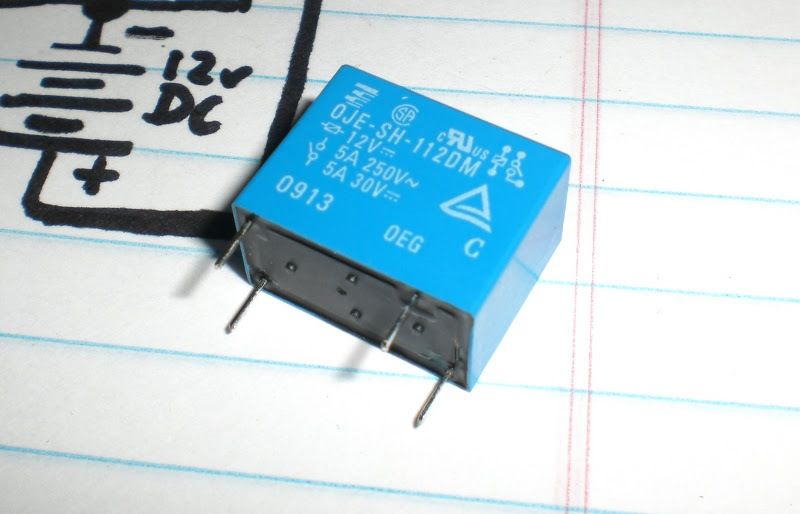 I’m still on the search for a good SPST NC momentary push-button to reset the relay and a case for the circuitry. The first prototype failed in tests. After turning the key and powering the bike, the ECU energizes the fuel pump for 3 seconds, then remains off until the bike has started and is running. The momentary power loss from the ECU between pre-start priming and when the bike and fuel pump are running caused the solid state relay to reset. This was fixed by adding a second relay to be latched by the first, instead of using the ignition power to latch the single relay. If one relay was used, the ignition power used to latch the relay would travel into the ECU, which I want to avoid to prevent possible damage. 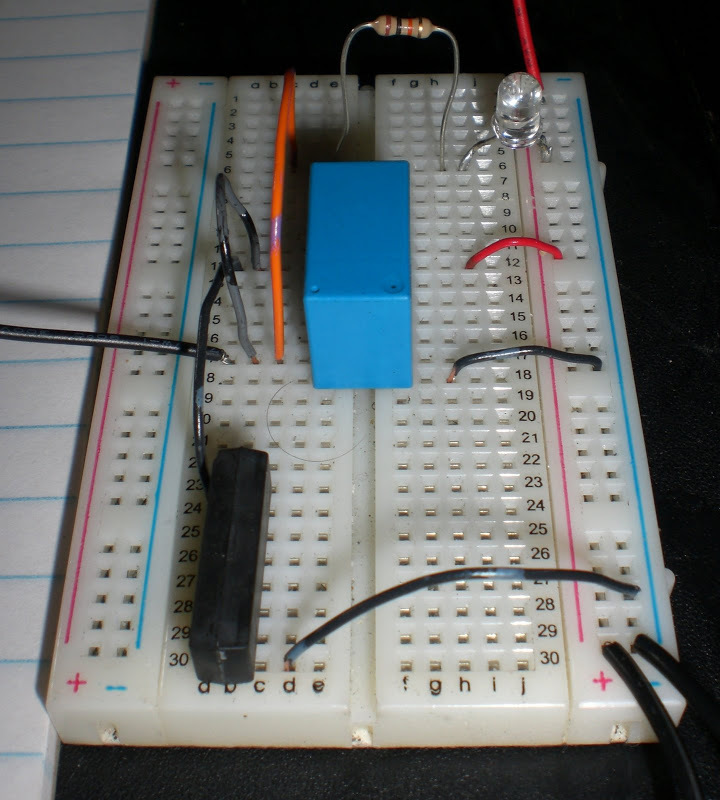 The second prototype on the breadboard worked perfectly in tests and was soldered onto perfboard. The first live trial worked flawlessly, but it’s currently too cold this December evening to do any more work behind the headlight with bare hands. It’s been sealed and mounted with 3M double-sided tape and zip ties in nice spot behind the headlight. 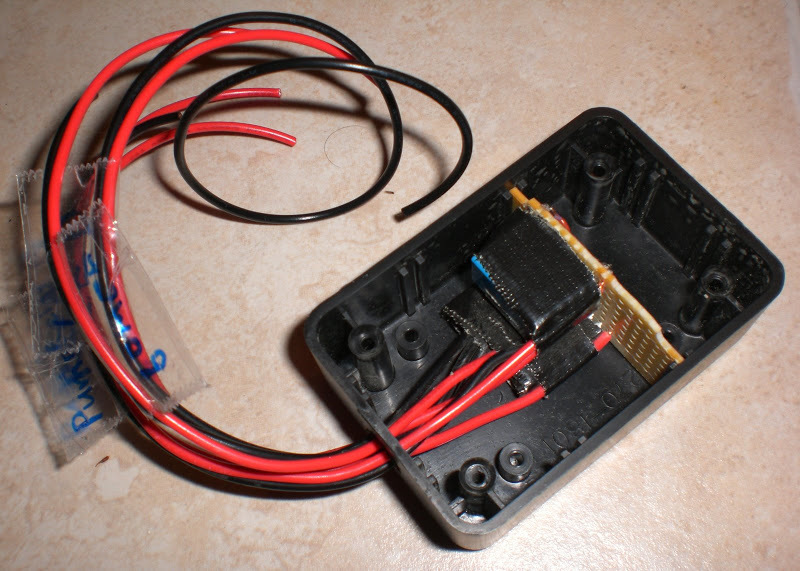 It should be noted that to prevent corrosion, all wires were soldered, covered with heat-shrink tubing, and the case sealed with silicone or epoxy to weatherproof. Two test drives lasted 0.25 miles and 0.4 miles until the engine died. The shorter distance was caused by 10 seconds at a red light. The 0.4 mi. test was in an uninhibited straight drive. Also, keep in mind that this was from a hot-start, without the need for the engine to warm up. Many cold starts require at least 10 seconds until the bike is drivable. I’m very satisfied by the results. As I said before, this is not my only theft deterrent. Thieves are clever and it’s best to assume they can find a way to separate you from your possessions. However, when security devices are used in combination, they increase the probability of thwarting a thief’s attempts. This circuit design is mainly aimed at theft after other security devices have been removed, as in about to get on, or while riding. This is a high-risk time for theft because the bike’s securities have [apparently] been disabled. If no other way to lessen the danger presents itself in a face-to-face theft, let the bike drive away and recover it shortly after.